Firing Stephen Miller is long overdue. As someone with a white nationalist ideology, he has no business being in the White House, writing policy, and crafting strategy. Miller is the rabidly anti-immigration architect of Trump's anti-Muslim ban, as well as an opponent of DACA. 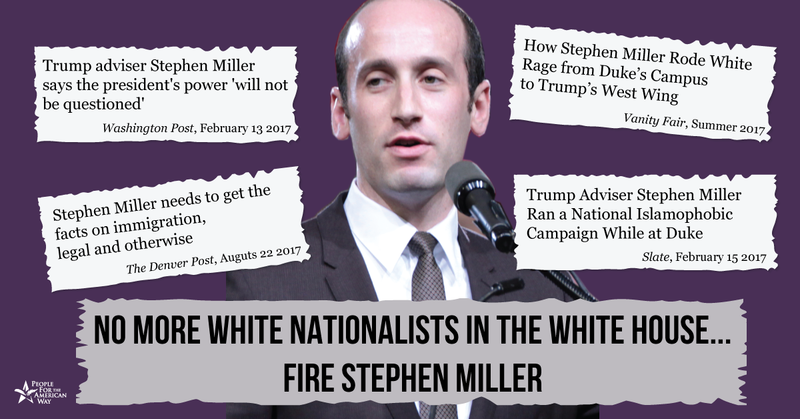 With the escalation in hate crimes since Trump's election -- from sometimes fatal violence towards religious and racial minorities to appalling displays of white nationalism and out-of-control Nazi rallies -- it is clear that Miller does not belong in the White House. His continued presence legitimizes the hateful beliefs of the "Alt-Right", white supremacists, and neo-Nazis and he works on policy with Trump that is racist, anti-immigrant, and xenophobic. Tell Trump: It's time for Miller to GO.